And the Chromecast Audio wants to do bring the high-res streaming game to your off-grid speaker system too. Google's new Chromecast has just been unveiled and it's looking to ride the rising tide of high resolution media all the way onto your TV. Since its 2013 launch the original Chromecast has been a huge success, there have been 20 million sold across the planet. A cheap device that was able to make even the most dumb of TVs into a smart, connected device. It was also seriously simple to use, making it a hugely accessible thing practically anyone with a smartphone or tablet could use. It's been so successful that, according to Google, the Cast button has been hit around one and a half billion times in the last two years since launch. And with the new Apple TV and Amazon's Fire TV range about to land it's about time Google got around to announcing what it's plans are. The new Chromecast isn't looking to reinvent the wheel, although its shape might belie such claims. The new hockey-puck aesthetic includes a short, flexible HDMI cable which will allow it to support more TV designs than its original all-in-one design allowed. It also comes with a couple of new colour schemes too. As well as the ol' classic (boring) black you can now go for either yellow or red. For the device that's going to remain hidden behind your TV for its entire life. But you'll know it's vibrantly coloured. Google is also giving the new Chromecast more choice in its screen saver support too, so you're no longer limited to Google+ pictures for your TV's wallpaper. Image isn't everything though and the new Chromecast is also coming with some redesigned wireless capabilities built into it. The improved WiFi performance comes, in part, from its new 5GHz wireless support. The new, higher-performance hardware allows for high-res streams to be supported by the new Chromecast without the buffering hit normally associated to them. And after the slightly limited audio support from the first Chromecast it's good to see that the likes of 7digital are now offering Cast support with its new Android app giving it the ability to stream hi-res audio FLAC files to your TV via the new Chromecast. And Google says there are more service partnerships on the way too. What's that? You don't want to listen to 7digital's hi-res audio files through your TV's ropey speakers? Well, the new Chromecast Audio has been made for you then. With the same size and shape as the new Chromecast, though a touch lighter, the Chromecast Audio will do for your old speaker system what the video version has been doing for dumb TVs for years. The new device will take cast audio streams and feed them into your standard hifi setup. All you need is a spare aux/line input, RCA or optical input. Yes, the Chromecast Audio will also connect via optical from its 3.5mm jack. Though it doesn't come with any optical cables in the package, just the standard 3.5mm analogue cable. Both the new Chromecast and the Chromecast Audio will go on sale for £30 each when they launch. 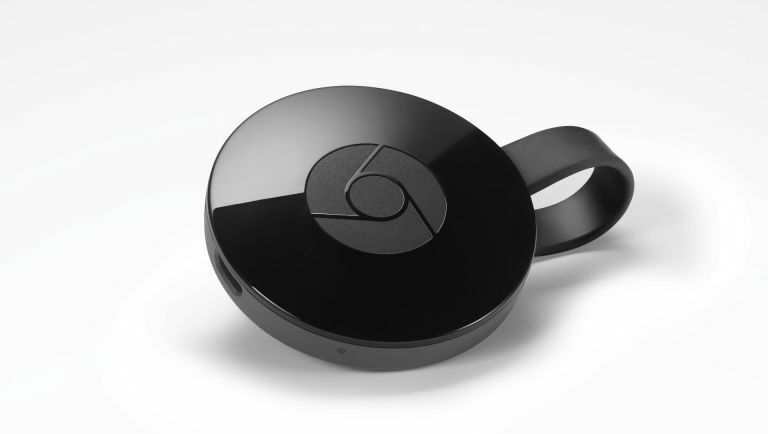 Everything you need to know about the new Chromecast.